Today is the day. Today is the day we complete the list of the Top 50 College Baseball Programs since 1975. Just a few thoughts on why these two landed in their respective spots. Cal State Fullerton – 18 trips to Omaha and four national championships plus three Golden Spikes Award winners, Tim Wallach, Phil Nevin and Mark Kotsay. Without the budget of a football school (the Cal State Fullerton football program was suspended in 1992), no college baseball program has had more success with so few resources. Since joining Division 1 college baseball in 1975, the Titans have had five head coaches and all five (Augie Garrido, Larry Cochell, George Horton, Dave Serrano and Rick Vanderhook) have taken the Titans to the College World Series. Fullerton has visited the Super Regionals 14 times and missed the postseason only four times (1985, 1986, 1989 & 1991) in the 44 years of the Regional Era. Miami – Four national championships and a whopping 25 trips to Omaha places the Hurricanes atop the Top 50 College Baseball Programs since 1975. Pat Burrell took home the Golden Spikes Award in 1998 while Miami made the postseason 42 times in the 44 year history of the Regional Era. The Hurricanes held the longest streak of postseason invites until 2017 when they failed to make the field of 64. Despite their recent woes, the Hurricanes are the best of the best in college baseball in the Regional Era. How did we come up with the methodology to rank these 50 college baseball programs in order? It was not easy but a little science and math rendered the results. In order to rank the greatest college baseball programs of the Regional Era you need to start in 1975, the first year the NCAA baseball eight regional format was adopted. 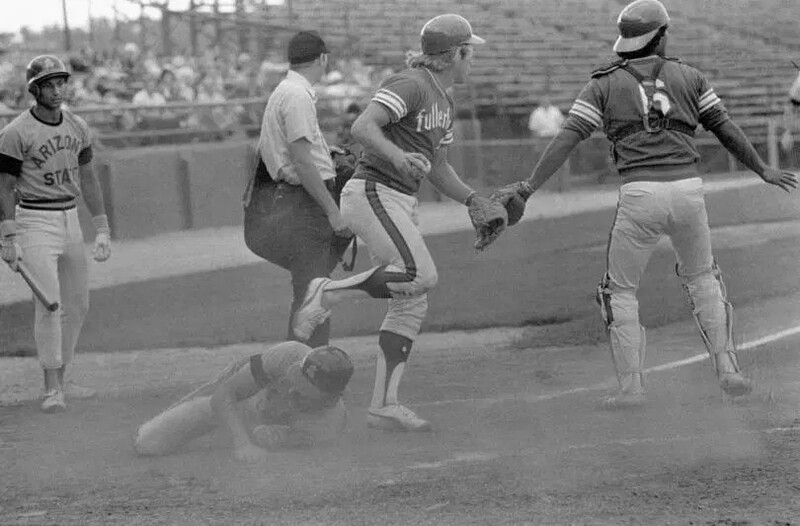 Prior to 1975, the college baseball tournament was chaotic with regional districts consisting of two to five differently formatted tournaments. In 1975, the format changed to include a regimented eight regionals consisted of four or six teams (depending on the year) in a double-elimination tournament. The winner of each regional moved on to the College World Series, also double-elimination. The field started with a total of 32 teams invited in 1975 but eventually grew to 48 by 1998. All would agree making it into the tournament field from 1975 – 1998 was more difficult due to less opportunity. The four-team regional format and the best-of-three super regional format debuted in 1999, with the expansion of the tournament to 64 teams. With 16 teams added to the tournament and needing to win not only a four-team regional but then a best-of-three super regional, getting to Omaha in the Super Regional Era became exponentially more difficult. In addition to considering regional and super regional success, we also appraised program success by Golden Spikes Award winners. The Golden Spikes Award is bestowed annually to the best amateur baseball player in the United States and is considered the most prestigious award in amateur baseball. By comparison, the greatest college football programs have been ranked using a system similar to ours that included national championships, bowl appearances, bowl wins and Heisman Trophy winners, considered to be the highest honor bestowed upon a college football player. Here at Cal State Omaha, we put together a ranking of the 50 greatest college baseball programs since 1975 based on a wide variety of factors. Those factors include National Championships, Golden Spikes Award Winners, appearances in the College World Series in Omaha, Super Regional appearances and post-season regional appearances based on the point system below. All data was placed in a spreadsheet to calculate each point value and the results rendered the Top 50. Those results will be revealed Friday, the day college baseball opens for business for the 2019 season. Make sure to check back if you are curious as to the exact break down of how your favorite team ranked. Disagree with how the teams were ranked or the rankings calculated? Leave a comment below or take us to task on social media.